CHICAGO (November 20, 2017) – Hyatt today announced the launch of Canvas Blanc de Blancs Spumante, a sparkling addition to the Canvas wine brand that was developed in collaboration with Folio Fine Wine Partners, a Napa Valley, Calif.-based wine company. Folio Fine Wine Partners, owned by the Michael Mondavi Family, has partnered with Venetian sparkling wine producer Villa Sandi to create this new sparkling wine to complement the successful Canvas portfolio, featuring a total of six signature wines. The refreshing Canvas Blanc de Blancs (white of whites), sourced from Villa Sandi’s extensive fruit resources owned by the Moretti Polegato family, is a blend of 100% white grape varieties with dry, fresh flavors paired with flower, fruity aromas and delicate hints of unique golden apple. To celebrate the launch, the sparkling wine was recently debuted on Friday, November 17 at an exclusive cocktail reception and “Truffles!” dinner held at the James Beard House in New York City. 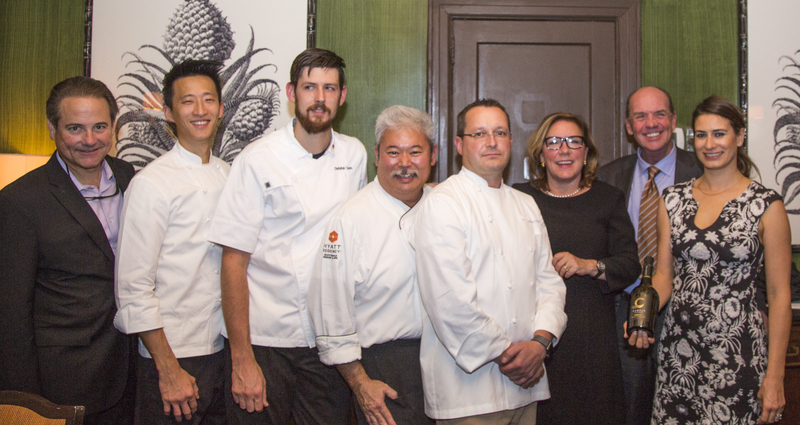 Guests were welcomed with a behind-the-scenes look into Mr. Beard’s kitchen to meet the Chef and team, followed by a 5-course food and wine tasting menu specially curated by Hyatt Culinary Director, Martin Pfefferkorn. Hyatt guests will be able to enjoy the sparkling wine while visiting restaurants, bars and in-room dining at all Grand Hyatt, Hyatt Centric, Hyatt Regency, Hyatt Place and Hyatt House hotels in the United States, starting January 1, 2018. In addition to the Blanc de Blancs, Hyatt hotels offer five other signature Canvas wines: Cabernet Sauvignon, Merlot, Chardonnay, Pinot Grigio and Pinot Noir. Inspired by a love of fine art, Canvas was created in 2007 by Michael Mondavi and his son, Rob Mondavi, Jr., President of winegrowing at Folio Fine Wine Partners, who worked closely with Hyatt’s food and beverage team to develop food-friendly, approachable California wines that would appeal to the discerning Hyatt customer. The wines are produced under the guidance of Folio Master Winemaker Tony Coltrin, who has worked alongside Michael Mondavi for more than 40 years. “From the very beginning of our collaboration with Hyatt, my family and I have dedicated ourselves to only producing fine, approachable wines that pair wonderfully with food. Each varietal embodies ‘the art of living’, which is what the Canvas line represents, and the sparkling Blanc de Blancs offers a touch of well-balanced elegance to appease even the most conventional wine drinker,” said Michael Mondavi. Folio Fine Wine Partners was founded in 2004 by Michael Mondavi and his wife, Isabel, with their children, Dina and Rob, who oversees winegrowing operations for the company. Folio is an importer, fine wine agency and producer of quality wines from the world's premiere and emerging wine regions, providing sales, marketing and public relations services to wine brands from California, Argentina, Italy, France, Austria, Germany and Spain. Wines under the Michael Mondavi Wine Estate include Emblem, Animo, Isabel Mondavi, M by Michael Mondavi. From Italy, are the wines of Bruno Giacosa, Coppo, Donnafugata and Villa Sandi. The Spanish portfolio includes Condado de Haza, Dehesa La Granja, El Vinculo, Fillaboa, Palacios Remondo, Tinto Pesquera and Vall Llach, with Charles Heidsieck, André Brunel (France), Laurenz V (Austria), and Benmarco, Crios, Nosotros, Susana Balbo (Argentina), Hangtime, Oberon (California) completing the portfolio. More information can be found at: www.foliowine.com.